One of the sins mentioned in Scripture is vanity. The term implies fruitless or empty pursuits, things accomplished in vain. Scripture also uses this same word positively, for the bonding that provides for man’s salvation. In his epistle to the Philippians, Paul uses the Greek verb to make vain or empty (ke-NO) to describe how Christ “emptied” himself, taking the form of a servant (2:7). In this most profound kenotic event of the Incarnation, Christ bonds and identifies completely with fallen humanity, offering man the prospect of being bonded with the Divine. As Saint Gregory the Theologian writes: “God became man that man may become God” (by grace not by nature; union without confusion). This is what Christ did and commanded his followers to imitate. When reviled, Saint Paul blessed; when persecuted, he endured; when slandered, he prayed for his enemies, being made the refuse of the world, the off-scouring of all things. (1 Cor. 4:12-13) He persisted in the face of serious corporeal punishment (2 Cor. 11:24-25) and became weary even of life (2 Cor. 1:8). Interestingly, we learn that the life of monastics is similar. They give up all to get closer to God and write of the deep despondency they experience because the God they leave the world for is apparently nowhere to be found much of the time. 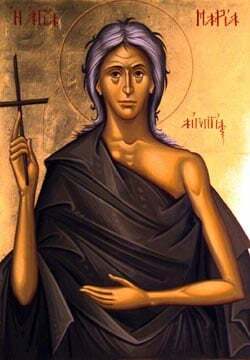 Anthony the Great, the anchorite and father of Egyptian monasticism struggled for twenty years with demons in the desert. When Jesus finally appeared to him, he asked, “Where were you?” Jesus replied, I was here. I was watching your struggle.” After this, Jesus blessed Anthony as a discerner of spirits and spiritual counselor to a multitude who came to him in the desert throughout his lifetime.